Be the first to share your favorite memory, photo or story of Steva. This memorial page is dedicated for family, friends and future generations to celebrate the life of their loved one. 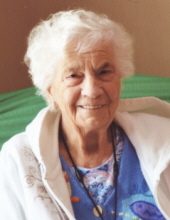 On Tuesday, March 26, 2019 Mrs. Steva MacPhee of Vermilion passed away peacefully in the Vermilion Health Centre two weeks shy of 89 years. Steva will be forever loved and missed by her children: Mary (Barry) Fizer, Cathie MacPhee, Micheal (Val) MacPhee, Maggie (Paul) Flaman, Janet (Stephen Green) MacPhee, Donald (Kim) MacPhee, Ronnie “Scrawny” MacPhee, Christine (John) Hartley, Brian MacPhee; Daughters-in-law: Anna Marie MacPhee, Margaret MacPhee; Grandchildren: Cheryl Ann MacPhee, Anthony “AJ” (Tally) MacPhee, Meagan MacPhee, Shannon (Chris Hinchliffe) Fizer, Adam Fizer, Teresa (Mike) Patterson, Hugh MacPhee, Jesse Flaman, Chris Flaman, Sara Flaman, Jeffrey (Lydia) Green, Savanna MacPhee, J.D. MacPhee, Stephanie Rurka, Duncan Rurka; Great-Grandchildren: Kendra Fehr, Kassidy Fehr, Isaac Flaman; Sister: Molly Stachniak; Brother: Peter (Judy) Harasiuk; Sister-in- law: Stella Harasiuk; as well as numerous nieces, nephews and extended family. Steva was predeceased by her much loved Husband Alex MacPhee in 2007; Sons: Francis MacPhee in 2008 and Robert MacPhee in 1998; Parents: Teador and Telka Harasiuk; Sisters: Mary (Bill) Kochenash, Olga (Mark) Shostak; Brothers: Michael Harasiuk, Matt Harasiuk; Brother –in-law: Mike Stachniak. A Prayer Service will be held at 7:00 p.m. on Tuesday, April 2, 2019 at the Catholic Church of the Holy Name, Vermilion. Mass of Christian Burial to be held at 11:00 a.m. on Wednesday, April 3, 2019 at the Catholic Church of the Holy Name, Vermilion. In lieu of flowers the family suggests that donations be made to the Catholic Church of the Holy Name, Friends of Vermilion Health Centre, or charity of donor’s choice. "Email Address" would like to share the life celebration of Steva MacPhee. Click on the "link" to go to share a favorite memory or leave a condolence message for the family.